John Walter, Clerk of the Drapers' Company from 1616-56, set up almshouses in Southwark and Newington Butts, including those on the current site, which were built in 1820 when earlier almshouses were relocated. 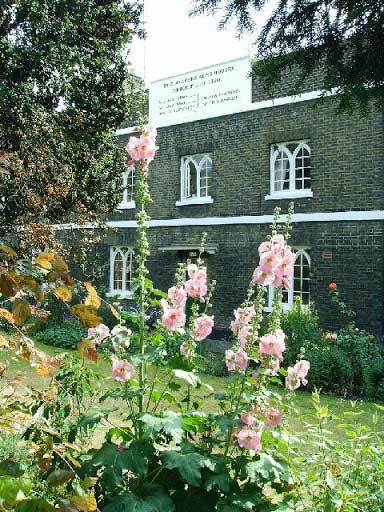 The original almshouses were established by St George's Field in 1650. The new Almshouses accommodated 16 men, women or spinsters, and consisted of a row of 5 houses of 2 storeys, in front of which were ornamental gardens with fuel stores and wash houses to the rear. A plaque in the centre has the words: 'The Drapers almshouses Rebuilt AD1820 William Gibbs, William Pugh Church Wardens Joseph Kesterton of this parish'. The Drapers' Company relocated the residents in c.1973 and the almshouses were sold, but remain as private residencies with a communal front garden. The Drapers' Company is first recorded in the C12th when the Mayor of London bequeathed the company his property in St Mary's Bothaw, and its first charter was dated 1364. The wool trade was immensely important in medieval times and the Drapers' Company became very wealthy, and acted as trustees to many educational and welfare charities. A remnant of their once extensive gardens is located on Throgmorton Street in the City of London, Drapers' Hall Garden (q.v.). The Company continues to make grants, and established the Drapers' Charitable Fund in 1959. The Drapers' Almshouses were founded in 1642 by John Walter, who started out as a member of the Girdlers' Company before he became Clerk to the Drapers' Company in 1616 - 1656. Erected in his lifetime, his almshouses were prompted by the plight of the many poor people he had seen who 'had lately perished by lying abroad in the cold for want of habitation', as a result of which he offered to build almshouses in the parishes of St George's Southwark and of St Mary Newington Butts, and by 1650 almshouses had been built in both parishes. The residents were 'aged, godly, and distressed, single men, single women or widows, who for a space of two years had been receiving parish relief'. In 1646 land was granted by St George's Fields where two houses were built, each having 4 rooms. Some of the residents were selected by the parishioners of St George's (q.v.) and some by the Wardens of the Drapers' Company. In 1653-54 a chapel and committee room were added. A century later the Trustees for the New Surrey Roads rebuilt the almshouses further back when the original site was absorbed into the new roadway of Borough Road. The third move took place in 1819-20 to this site in what was then Hill Street, renamed Glasshill Street in c.1937/8, which was next to the existing Rowland Hill Almshouses, now long gone. The new Drapers' Almshouses, also known as St George's Almshouses or Cottages, consisted of a row of 5 houses of 2 storeys, which housed 16 occupants. In front of the almshouses were ornamental gardens and behind was a long row of fuel stores and wash houses. In 1961 the Drapers' Company built new almshouses in Brandon Street, which were named Walters Close after the founder, to replace the old Newington Almshouses in Draper Street, demolished for road-widening at Elephant and Castle. A decade later these were enlarged to accommodate the residents from Glasshill Street and the latter almshouses were then sold by the Drapers' Company in 1973. In 1872 the alms-house garden appears to have consisted of 12 unequal plots and in 1939 of 5 equal plots. A description in the Drapers' Company 1939 Register of Properties states that the properties were set back from the road and had 'ornamental little gardens'. It appears that in living memory the local Sunday School would have an annual picnic in the garden. The communal garden today has lawn, flower beds and a few trees, including a commemorative rowan planted in 1990 from the Wildlife Trust. LPGT Volunteer Research by Patricia Birch, 2007.